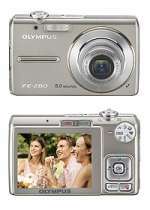 A premium combination of design and features lend the Olympus µ 830 irresistible qualities. With the luxury of a 5x optical zoom (equivalent to 36-180mm on a 35mm camera), photographers can get closer to subjects without having to move an inch. Double protection against blur caused by camera shake, which is more likely at high magnifications, is provided by Dual Image Stabilisation – a combination of high ISO setting and a mechanical image stabiliser. This autumn, Olympus introduces a camera that boasts both elegance and power. The Olympus µ 820 is a dream come true with an impressive 5x optical zoom and stylish, weatherproof* body in Midnight Black, Starry Silver, Ruby Red or Crystal Blue. Exciting colours and more magnification power are only the beginning: A giant 6.9cm HyperCrystal LCD makes this camera ideal for framing and reviewing shots with friends. The µ 820 also lets you say goodbye to blurry or poorly-exposed faces in photos: The integrated Face Detection Technology scans compositions for faces and then optimally adjusts exposure and focus settings to return the best results. Furthermore, 8.0 Megapixels ensure not a precious bit of image detail goes missing. Shockproof against falls from 1.5m and waterproof to a water pressure equivalent of 3m, the newest addition to the µ tough series keeps up with just about any active lifestyle. There’s no need to think twice about taking it along on a mountaineering trek or letting the kids take a few pictures at a picnic. Even for shots at the beach or capturing the wonder of marine life while snorkelling, the µ 790 SW can take it all. For added fun, it is available in a choice of four expressive colours (starry silver, midnight black, sunset orange or marine blue). This attractively styled camera also incorporates a number of exciting innovations such as Face Detection Technology – which improves exposure and sharpness of human subjects by recognising faces in a composition and automatically optimising the settings accordingly. Craving a camera that combines high performance and simplicity? 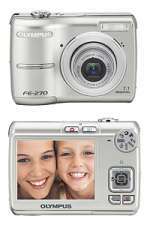 The Olympus FE-270 keeps things fun and easy with the assurance that your precious memories are captured in Olympus quality. It boasts 7.1 Megapixels plus a 3x optical zoom and a large 6.4cm LCD along with a range of selectable scene modes to suit the photographic situation at hand. With an ultra-slim, stainless metal exterior available in four brilliant colours, the Olympus FE-280 represents a new generation of fun and easy digital photography. Express yourself with a choice of silver, blue, black or red, while enjoying the performance of 8.0 Megapixels and the power of the new TruePic III image processor. Including a large 6.4cm LCD for added viewing ease, the feature-packed Olympus FE-280 goes above and beyond to offer you a brilliant and beautiful combination of simplicity and functionality. 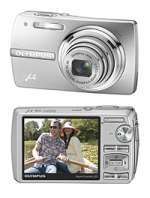 You can demand more from your camera with the 4x wide zoom Olympus FE-290. It delivers the most versatility in its class – all in a pocket-sized silver or black housing. With a powerful 7.1 Megapixels and giant 7.6cm LCD, it’s a cinch to quickly frame and capture high-resolution shots which you can immediately show to all your friends. 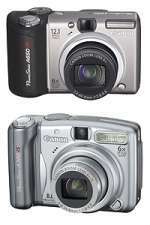 And thanks to this camera’s “One button, one function” design principle, creating great images is simpler than ever. Get the ease, flexibility and performance you want from an entry-class camera. 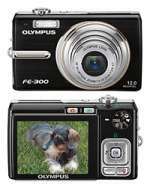 The Olympus FE-300 is equipped with an astounding 12.0 Megapixels to let you capture every bit of detail while retaining the ability to crop and resize images later on a computer. Face Detection Technology works intelligently to ensure the accurate depiction of human subjects, while high ISO settings help to prevent blur caused by camera shake. The extremely powerful and ergonomically designed Olympus SP-560 UZ continues where it’s award-winning predecessor, the SP-550 UZ, left off. Boasting an astounding 18x wide optical zoom (equivalent to 27-486mm on a 35mm camera), photographers have virtually all options open to locate and frame their subjects, both far and wide. This versatile camera incorporates Dual Image Stabilisation to provide double protection against blur caused by camera shake – which becomes more likely as the level of zoom increases. Furthermore, Face Detection Technology has now been included to guarantee the capture of sharper, more accurately exposed faces. 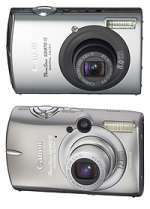 This model also upgrades the resolution to 8.0 Megapixels, ensuring no detail goes missing. 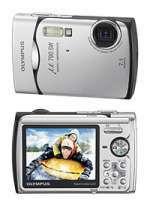 Get ready for the Olympus SP-560 UZ to take you where you’ve always wanted to go. 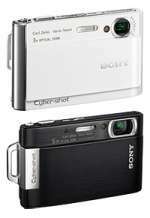 Memorable photos are at your fingertips with two new slim, yet powerful Sony Cyber-shot T-series cameras. Both offer an intuitive touch screen that allows you to instantly select the subject you want to focus on (in shooting mode) and what you want to view or where you want to zoom (in playback mode). For parents looking to capture and re-live their children’s back-to-school memories, Sony is introducing a super-zoom digital camera small enough to carry to any school activity. The new 8-megapixel Cyber-shot DSC-H3 camera has a powerful 10x optical zoom lens for those close-up shots you don’t want to miss, and yet features a super compact form so you can take the camera along anywhere. The new 21.1-megapixel, full-frame Canon EOS-1Ds Mark III Digital SLR camera brings the power of Canon professional imaging excellence and innovation into sharper focus than ever before. 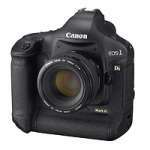 While Canon's EOS-1D series has dominated the 35mm-based professional Digital SLR market for the past six years, the new EOS-1Ds Mark III Digital SLR takes Canon's pro-digital prowess into and the realm of high-fashion and commercial photo studios where bulkier, medium-format cameras previously reigned. Following months of intense anticipation by Digital SLR enthusiasts worldwide, the EOS 40D DIGITAL SLR Camera from Canon is scheduled to begin sailing into stores in early September. Building on the success of Canon's perennially popular "prosumer" EOS 20D and 30D models, the EOS 40D advances the state-of-the-art for mid-range Digital SLR cameras, making it a natural first choice for advanced amateur photographers and entry-level professionals, and an ideal second body for more established photo pros. 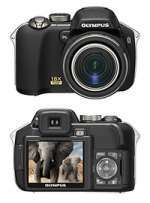 Canon announced today that its acclaimed G-series has a new top-of-the line model - the PowerShot G9 digital camera. The PowerShot G9 digital camera offers serious shooters and value-minded professionals a feature-packed camera with many of the advanced photographic capabilities of a high-end Digital SLR camera, in a lightweight, compact package at an affordable price. Canon today introduced two new compact PowerShot Digital ELPH Cameras - the top-of-the line 12.1-megapixel PowerShot SD950 IS Digital ELPH and the status-setting 8.0-megapixel resolution PowerShot SD870 IS Digital ELPH. Both cameras still have the alluring charm and color that keep them ahead of the aesthetic curve, but now they are also loaded with advanced features and functions, making them perfect for the trend-setting techie. For the consumer attending a sunny backyard soiree, a relaxing respite getaway or an electrifying night on the town, these two Digital ELPH cameras continue to hold court as the perfect combination of beauty and brains. Canon today introduced a brand new PowerShot line - the SX series - and the first camera in that line-up, the ultra-zoom PowerShot SX100 IS digital camera. The PowerShot SX100 IS digital camera features a 10x optical zoom, an Optical Image Stabilizer (OIS) and an extended grip, making this light and small shooter capable of capturing magnificent images clearly, even at long range. Canon today announced two new PowerShot A-Series digital cameras, including one with the highest resolution in the series to-date - the show-stopping 12.1-megapixel PowerShot A650 IS digital camera - and the powerful 8.0-megapixel PowerShot A720 IS digital camera. These new cameras continue the promise of the PowerShot A-Series by delivering superior image quality at a great price.